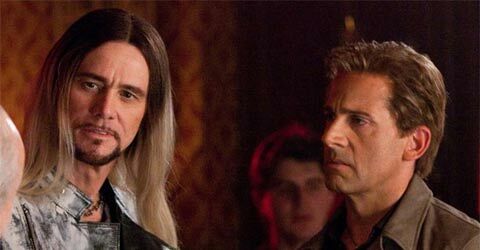 This weekend two of the world’s biggest comedic stars will be going head to head in Don Scardino’s The Incredible Burt Wonderstone. In one corner there’s Steve Carell, starring as the titular illusionist, who after years of success has let his act – and his friendship with partner Anton Marvelton (Steve Buscemi) – go stale. And in the other corner there’s Jim Carrey, playing a David Blaine/Criss Angel riff named Steve Gray, whose act isn’t so much about “tricks” as it’s about inflicting as much pain on himself as possible. But before the duo’s new movie arrives in theaters this weekend, the duo was in Las Vegas as part of a press event to talk about their latest collaboration (which fans will notice is their third after Bruce Almighty and the animated Horton Hears A Who). At the top of the press conference, held at the Paris Las Vegas Hotel & Casino, the actors and filmmakers on stage, which also included Buscemi, Olivia Wilde, and screenwriters John Francis Daley and Jonathan Goldstein, were asked what they saw if they saw any similarities between their professions and the ones that they portrayed on screen. And while Carell sees a comparison in that both work to disguise reality and “represent things that are not necessarily who they are,” Carrey actually sees more of a negative side to the illusionist’s performance. While he may have his own personal issues with the idea, however, that doesn’t mean he didn’t work to bring his full creative force to Burt Wonderstone. Not just going at the character from a psychological stand-point – saying that Steve Gray has a “Christ complex” – he also contributed to the look by designing the tattoo that the character so proudly sports on his back. Getting assistance from professional outside help didn’t stop at the Ace Ventura stars tattoos. Early in the film, Burt and Anton perform a trick during their act called The Hangman that was actually designed by David Copperfield - who also has a small cameo in the film. What’s really impressive about it, though, is that the crew didn’t use any camera tricks or effects to alter the illusion. But Carrell had to work hard on his own magic abilities as well. Difficult as that was, one element that was surprisingly problem free was shooting on the streets of Las Vegas. While logic would dictate that everybody would want to see a major Hollywood film being made with big stars, the filmmakers actually had a hard time trying to get people to come watch the movie’s big Hot Box stunt. “I totally lost the audience, which of course I planned to do from time to time. Rodney Dangerfield used to stand backstage and howl with laughter at my failure. I’d come off stage and he’d say, ‘Man, they’re looking at you like your from another planet,’” Carrey said, punctuating with a pitch-perfect Dangerfield impression. Despite all of the highs and lows of their careers, both stars are still miles away from the Burt Wonderstone character, who has let all of his success go to his head and empty his life. “There are so many highs, I find myself working with guys like this, there’s moments in your life where you go, ‘I can’t believe how insanely lucky I am.’ And then you can turn around and the next comment you can feel so completely caught up in your own wanting and desiring and needing and feeling like you’re missing something -- the higher the high, the lower the low,” Carrey said. The Incredible Burt Wonderstone opens in theaters this Friday.